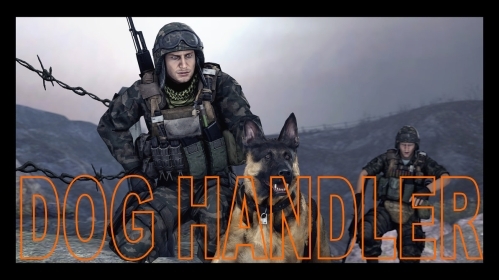 Are you a good dog handler? The term dog handler is the term used to identify or describe the person who is in charge of the dog, who guides, drives and limits the dog and helps the dog achieve success in whatever the dog handler and dog are doing and provides access to rewards and rewarding activities. I wanted to talk a bit about this role because I think many people underestimate what their role as a “dog handler” is, or needs to be. Granted the term handler is more commonly thought of in professional or competitive circles but I feel it still applies to the pet dog owner very much as well. It’s well known that dogs behave differently with different handlers, this can even happen in the same household between two adults, so it strongly proves that dogs need guidance and take it where they find it, and of course make their own choices when no guidance is available. I wanted to take a minute here and give a few examples of what I think various dog handlers need to focus on and take on as their responsibility. The Handler needs to direct his or her dog to display the correct behaviour for the situation. This could mean locating a person hidden or scent work where the goal is to locate hidden drugs, explosives, money, bugs etc . This may sound simple but if the dog is trained for more than one purpose, having a dog choose to bite a person whilst conducting a narcotics search is not the goal. Would the dog do that? Well if he or she prefers bite work to search work and is able to make his or her own choices then yes of course this can and does happen. This problems occurs I believe because the handler does not provide enough direction and limitations in the learning phase of training and allows the dog to display the behaviour he or she chooses in training. The Handler must manage the dog so that the dog is not able to rehearse behaviours that are not in line with what the dog should be doing at that moment. This may include crating the dog, having the dog in a relaxed (switched off) position, but more importantly I feel it would be having a dog that responds to the handlers cues to display the behaviour rather than having a dog that triggers into a behaviour based on his or her own judgement. I always train dogs to enter into anticipation for a task or activity on my cue, not on the situation, environment or external stimulus. An example would be that, I was demonstrating one of my dogs to a working dog team and when we entered the area to do some detection work, there were a number of bite suits hanging on the wall near the search area. The person in charge directed one of his staff to remove the suits so the dog would not be distracted. I asked him to leave them there and the dog was given a search cue and he searched and found the target odour, ignoring the suits. Would my dog prefer to bite the suits? very much so. But the cue for bite work and the cue for search work are different and this means in his past he has made the mistake (in training because I set it up) and failed to receive any reward from either the search or the bite. By running this “set up” a number of times with the only successes coming from my direction, the triggers have the dog only anticipate the outcome I want. The Handler must rehearse the behaviours he or she wants the dog to display in a controlled area until the dog is capable of displaying the behaviours under distraction. Until the dog can follow cues without mistakes the handler needs to observe, guide and limit the dogs behaviour choices by controlling the environment, rewards and consequences. See above, your job is the exact same as the working dog professional handler, or at least it should be! Let’s look at how you might interpret the above guidelines for your dog. The Handler needs to direct his or her dog to display the correct behaviour for the situation. 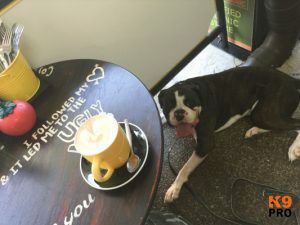 Ok so your dog doesn’t search for drugs or doesn’t apprehend criminals, but perhaps you would like your dog to go to a Cafe with you and enjoy a coffee midst a morning walk. Most people just walk into the cafe, sit down and spend 15 minutes chastising their dog for doing all the things they do not want him to. Sniffing other peoples food, getting up, jumping on them, going to another dog or showing aggression etc. Did anyone ever prepare and teach this dog what it SHOULD be doing? Does this dog understand that the requirement is to lay down for 30 minutes, calm and relaxed and wait to be released? If he or she does know, have they ever shown you that they can do it? Asking your dog to do something that they have not been trained to do will most certainly end in failure. The dog needs to be taught what is expected and how to deliver the right behaviour and this exercise rehearsed until the dog is proficient at it. Then distraction (reasons for the dog to question if he or she still can display the behaviour) needs to be added until the dog can perform the behaviour at a higher level distraction than your likely to encounter at the coffee shop for longer durations than your likely to be at the coffee shop. The dog can then be guided into this behaviour and your likely to see the behaviour you want. Arguably the worst examples of this one are when people get puppies. They allow the puppy freedom in the house only to run around streaming “NO” at the puppy 514 times a day. The puppy will either end up immune (desensitized) to your voice or fearful of you when what should have happened is some management such as a puppy pen that will prevent the puppy accessing problem behaviours when you’re not there to supervise. Management may also be as little as giving a sit command to a dog as a dog walks by rather than let your dog stand there and wait until it jumps on the other dog. Having a long line fitted to your dog until the recall is reliable is also good management of that cue. Calling your dog when the dog has the opportunity to ignore your recall is allowing the recall cue to become an optional command and people find that the dog takes the option not to come under any distraction. Dogs that display problem behaviours will never learn to control themselves if being taught under distraction. It is only fair to teach the dog the skills you need him or her to learn in an environment that will not be clouded by other things in the environment, competitive, frightening or stimulating things that your dog has not yet learned how to self manage. We have an incredibly successful board and train / rehab program running here, it has become known amongst most dog owners and professionals that we tackle the most serious cases that can be found, you can check our YouTube Channel (link) to see some of our work. 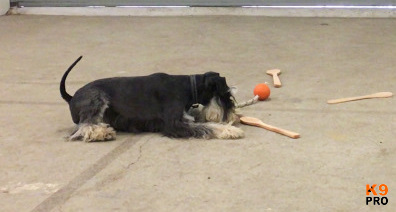 We think that the success comes in two stages, the first is of course to find out the root cause of the problem the dog has and then to teach functional skills to the dog, impulse control and using these new found skills deliver controlled exposure until the dog is more psychologically balanced around the problem stimulus. Stage 2 is to re introduce the dog to their owner and then teach and train the handler on how to drive, guide, limit and help their dog keep displaying these nice behaviours. 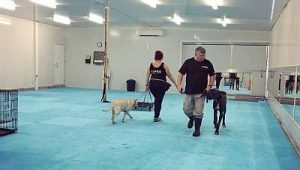 The owner becoming a dog handler is one of the most important phases as the dog will need a lot of guidance, limits, management and rewards in the early stages of rehab. The success only comes when we master both phases, so we try very hard to make sure the owner invests time in themselves to become the handler their dog needs. This is a crash course on timing, rewards, controlling pressure and exposure and reading and keeping their dog safe, and as you can see when people invest in themselves and their dog, they end up with a wonderful relationship. When a dog is going through rehab and entering phase 2, transitioning back to the owner / handler, this dog handler will need to learn how to guide and limit their dog until the new behaviours are solid. This will mean learning to give their dogs well timed cues on how to behave and insiting the dog carry them out, it also means observing the dog and taking action at the initial sign of an old behaviour. It means coming to terms with the fact that every time you interact with your dog, you are training it, training it to be better or training it to be worse. There are no walk, but there are training exercises which of course at some stage turn into walks, but not when the dog is working through a problem. There is an old saying, “The best handler can make the worst dog look good, and the worst handler can make the best dog look crap!“. Dogs are not computers, cars or machines, they are living breathing and thinking beings that have their own thoughts, feelings , fears, phobias and values. When we get a new puppy, the handler needs to help the puppy learn the correct values, to think like the handler and not to be fearful of phobic of anything. This of course takes a very detailed program with careful adherence and adjustments all the way through. People flying by the seat of your pants is one of the main reasons I am booked so far in advance. We have had a lot of people who are training service dogs, assistance dogs etc complete this program and sail through their training, pet owners also learning how to develop their puppy into the adult dog they really want. This “pro active” approach is aimed at educating you and your puppy so that you can avoid all or at least the major pitfalls in terms of dog behaviour in the future. When you make a mistake in raising your puppy and the puppy or dog learns something it shouldn’t, it is many times harder to retrain something as it is training it correctly at first. The second problem is that once a dog learns a behaviour, the dog never forgets it, but with effective rehab, the dog may not keep displaying this behaviour when handled well, so it makes very good sense to be PRO ACTIVE. A good handler also recognises a problem in their dog early and takes action as soon as possible. Hoping the problem will go away, hoping the dog will grow out of it or ignoring it will certainly seat the problem much deeper in your dog. I work with a lot of dogs that have behaviour problems, often unwanted aggression is one of the more common behaviour problems I deal with and it can take quite a toll on the handler / owner of the dog. This is what I mean by a damaged handler, a person who has lost their confidence at being able to handle (you know – guide, drive and limit the dog and helps the dog achieve success in whatever the handler and dog team are doing.) their dog. They have tried and failed so many times they just go into damage control each time they see the “thing” that sets their dog off. They have become trapped in a world that could mean they fall victim to an explosion of aggressive behaviour from their dog anywhere, anytime they are outside the home. They try either not to walk their dog or resolve to walk at ridiculous hours of the night or very early morning, I call this walking at “Vampire Hours”, but of course when all the people in your neighbourhood that have aggressive dogs decide to walk at these hours, every day you will be walking amongst other “Vampires” with aggressive dogs. Imagine that with people like this, we really have to focus just as much on phase 2 as phase 1. (Phase 1 dog rehab, phase 2 owner education). Our program differs from many as most board and train programs end when the dog is handed back, where as my program is only half complete, I start working with the owner at the hand over and turn them into a handler, the handler their dog needs! This is not YOUR FAULT, but you can empower yourself with good education. Your dog CAN BE HELPED! So you have been to other trainers? I bet you didn’t know that 95% of my clients with the worst dogs have been to other trainers before getting success with me. If you have had advice that your dog cannot be helped and or should be euthanised, contact us before making any rash decisions that cannot be undone. No, there are no quick fixes, but don’t expect to work at this problem for years either… You might also like this article on Dog Aggression. As always we welcome your comments and thanks for reading our Blog! Next Are Dogs With Behaviour Problems Abused? I have a dog that needs help (and me of course!) could you let me know what sort of cost would be involved. Just give our office a call on 02 45 789 789 or send and email to info@k9pro.com.au and they will help you. Valuable information and article, Steve, from a previously damaged handler of yours! What an amazinfngly lovable and grustworthy dog I have today! That you do, and you made a 2.0! Fantastic information and couldnt agree with you more. We at times run seminars and workshops but generally people from Brsibane come to see us, we have a service called High Intensity where you would be here for a few days to supercharge your progress.